This native of Kingston Springs, Tennessee was recording for the Coral company back in 1953. She was about five feet three, with light brown hair and brown eyes. She didn't start singing until about four years previous to that (circa 1949?) was something of a hit on her first personal appearance tour that took her from coast to coast. 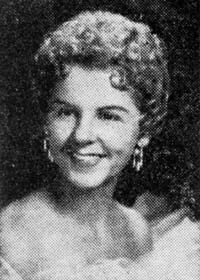 When she got back to Nashville, a fellow by the name of Owen Bradley contacted her and got her under a recording contract with Coral Records. She was also a bit of a sportswoman, said to be quite adept with a gun or rod and reel. Cowboy Songs Magazine No. 26; May 1953; American Folk Publications, Inc.; Derby, CT.